Electrolux has been included in the prestigious Dow Jones Sustainability World Index (DJSI World) for 2014, and retained its position as Industry Leader in the Household Durables category for the eighth consecutive year. In this annual assessment, published by RobecoSAM, Electrolux was also included in DJSI Europe. DJSI World includes the 10% best-in-class economic, environmental and social performers among the world’s 2,500 largest companies. Electrolux is the only company in the Household Durables category to qualify for DJSI World, and has been included in DJSI every year since the index was launched in 1999. The Dow Jones Sustainability Indices enable investors to integrate sustainability considerations into their portfolios while providing an effective engagement platform for encouraging companies to adopt sustainable best practices. For more information about this, go to www.sustainability-indices.com. For further information, contact Electrolux Press Hotline, +46 8 657 65 07. Electrolux is a global leader in home appliances, based on deep consumer insight and developed in close collaboration with professional users. We offer thoughtfully designed, innovative solutions for households and businesses, with products such as refrigerators, dishwashers, washing machines, cookers, vacuum cleaners, air conditioners and small domestic appliances. Under esteemed brands including Electrolux, AEG, Zanussi, Frigidaire and Electrolux Grand Cuisine, the Group sells more than 50 million products to customers in more than 150 markets every year. 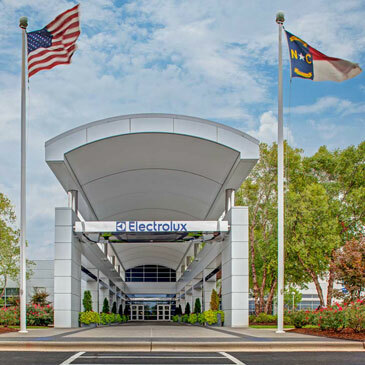 In 2013, Electrolux had sales of SEK 109 billion and 61,000 employees. For more information go to http://group.electrolux.com.